As I've been watching episodes from Universal's ALFRED HITCHCOCK PRESENTS - SEASON ONE, I've found myself responding warmly to an aspect of the show that we just don't have anymore in our entertainment, and it's stoked a rather perverse form of nostalgia in me. I'm charmed by the way Mr. Hitchcock (as host) could discuss the premise of homicide -- even suicide -- with such exquisitely dry humor. I'm equally dazzled that he could take this approach to his weekly stories without having his tongue-in-cheek attitude contaminate the stories at hand. (You'll remember Hitchcock's wonderful trailers for PSYCHO and THE BIRDS, both delightfully funny, which is something no one ever accused those two films of being.) At the outset of "The Case of Mr. Pelham," a doppelgänger fantasy, he actually apologizes at the top of the program because viewers may be disappointed at not receiving their weekly dose of "mayhem" -- meaning murder. What a sane society it must have been. The nature of Hitchcock's intros underscore how tied the concept of domestic murder was, in those days, to fantasy. Yes, murder was then a fact of life and we were only a decade away since a devastating World War, but somehow it could be dramatized and presented as a form of escapism. I can remember when some of the later seasons of ALFRED HITCHCOCK PRESENTS were actually aired, and how the grown-ups around me always chuckled at them and treated them as stress-relieving, as a kind of tonic. In the 1980s, NBC colorized the Hitchcock intros and brought the show back, but it didn't last for more than a season -- the notion of murder was no longer so tongue-in-cheek, and the show played differently, quaint and out of its time, even with new actors in the parts and redone in color. Today, things are even worse; there is so much violence and abuse in our world, in the news, and its all so realistically and extremely treated in network crime series, it's impossible to think lightly of homicide anymore, in the way that was once so central to the enjoyment of mystery fiction and the celebrity of a director who is still, curiously, universally beloved by the common man. 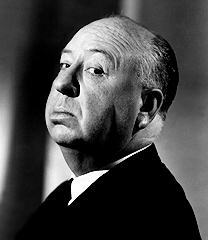 Hitchcock spoke to his audience as if every man watching his program secretly wanted to kill his wife, and vice versa -- and they ate it up. People had a sense of humor about it in those days... because they could. The majority of people were then sane; they didn't imitate what they saw on television, at least not in epidemic numbers. I think we lost something important, as a society, when we lost our ability to laugh at things like this. When we could no longer laugh at someone killing their spouse and failing to get away with it by some terrible last-second twist of ironic fate, it meant that we had started taking such notions too seriously -- and not necessarily out of social concern.